We’ve seen a million or more police procedurals in movies and on television; they began well before TV’s Joe Friday was around keeping Los Angeles safe. Time enough has slipped by for us to now learn the intricate steps of the drone procedural. That’s what Gavin Hood’s new film, Eye In The Sky, allows in such a brilliant manner. 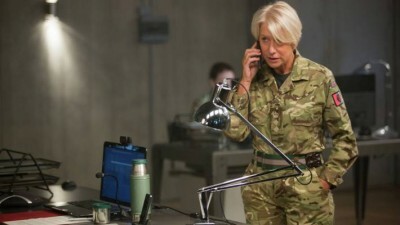 Al-Shabaab is the “bad guy.” Helen Mirren, as Colonel Catherine Powell, is the principal good “guy” tasked with capturing a British citizen who’s gone over to Al-Shabaab’s side. But going along, the story complicates itself into an absolute edge-of-your-seat smart thriller that becomes a mission not to arrest, but kill … with collateral damage being a major part of the problem. 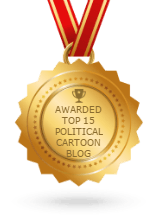 What about the young Kenyan girl unknowingly just outside the targeted Al-Shabaab safe house where the bad guys are suiting up in their suicide bomb vests? The child is merely bringing in a modicum of money for her family on a sunny afternoon. Along the dusty thoroughfare, she’s selling her mother’s freshly baked bread. Colonel Powell and her cadre of high tech people on the ground in Nairobi, Nevada and Britain are all connected by the awesome technology of satellite audio/video communication. The team is terribly surreptitious about how it sets about to accomplish the mission: drones; ones that fly high above… all locked and loaded … and tiny drones that just snoop. If you saw one land on your arm in the warmth of summer, you’d smack it with the palm of your hand. Talk about bugs. Then there are those pesky miniscule drones you’d swear are just sparrows flitting about over the target, but actually gathering in-the-moment intelligence for eyes and ears scattered around the world. Talk about privacy. Eye in the Sky presents itself with the same precision as modern drone warfare. Keep your eye peeled for the occasional graphics that appear at the lower left of the screen in order that you know in what hemisphere the next scene is about to take place. The military’s chain-of-command as well as the pecking order of major governments are a large part of Hood’s film too. One of those characters is Colonel Powell’s immediate superior, Lieutenant General Frank Benson, played by the recently passed and truly fine actor, Alan Rickman. As it usually happens with Rickman, scenes get stolen by him. Eye in the Sky is dedicated to his memory. 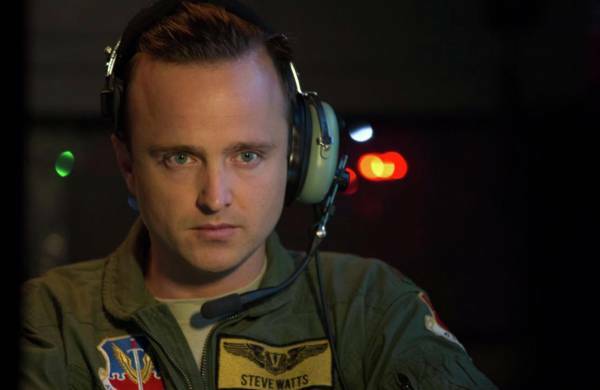 Well down the chain-of-command, a long distance from the target, there’s Steve Watts. Aaron Paul, “Walter White’s” obstreperous assistant meth chef on cable’s Breaking Bad, is that all important trigger guy in the Nevada desert. Watts, with his new assistant played by Phoebe Fox, makes hellfire missiles fly. Everyone in this scattered chain for executing an important mission in Kenya can plainly see the little girl selling her family’s baked goods. So can you. Morality is — if you’ll excuse the expression — the trump card for all that’s afoot in this excellent movie. How many will be killed later by a squad of zealous suicide bombers over against the collateral damage that would ensue if the order comes down to fire ordnance from the drone anonymously circling the Nairobi sky. 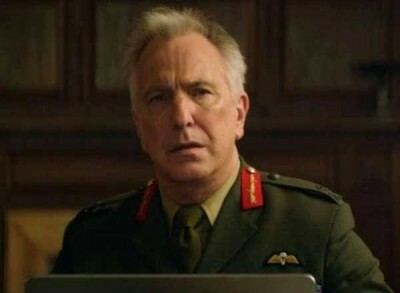 This powerful statement is an appropriate addition to Guy Hibbert’s screenplay, as Eye in the Sky lauds military personnel and powerful politicians alike for the hard decisions they must often make. But I couldn’t help thinking also about people involved in such real life kinds of decisions who can’t feel the tug of humanity on their souls.